Spring is here, winter is over, and everything is wet! Who’s ready to go off road and kick up some mud? Whether you’re planning a tailgate or you’re sick of the interstate, you’ll need a vehicle that’s up for the challenge. At Uftring Chrysler Dodge Jeep Ram in North Pekin, we have what you’re into! 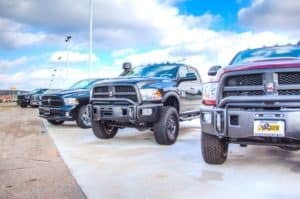 So, whether you prefer the roar of a Ram or the look of a Wrangler, we have the selection of choices for you. The style you choose comes down to your preference. Always been a Jeep lover? We don’t blame you. These Off-Road SUVs have the ground clearance and capability necessary to handle any muddy condition. And if you grew up driving Rams, we understand! There’s nothing quite like these tenacious trucks. 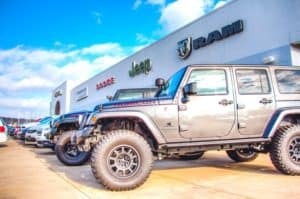 If you want to raise the bar on your Ram or need bigger wheels for your Wrangler, stop by our parts department at Uftring Chrysler Dodge Jeep Ram. Our trained professionals have the knowledge and experience necessary to up-fit your vehicle to your liking. So, whether you wish to add to your ground clearance, change your tires, or enhance your exhaust, we’re happy to make that possible. Whether it’s for your own liking or it’s to increase your off-road performance, we have the experience, selection and quality vehicles and parts available. Click here to access our off-road inventory. To contact our parts department, click here. We look forward to working with you!